Second. The reformers of the liturgical language claim that among the people of today, there are great linguistic difficulties for them to approach the liturgical life. They cannot understand it, and thus, it must be expressed in a more contemporary form. Without denying this need, we have to observe that all of us, even theologians, totally forget that the language of the Church, and especially of Her worship, of which Her expression consists, and in which takes place the mystical and real meeting of man with God, is mostly a symbolic language. Symbols predominate the entire theology and life of the Church. All the liturgical arts use this symbolic language, and in this way, they speak to the faithful Christian. Orthodox iconography expresses something very deep. It does not care much for the surface of things. It provides us with the witness of the deified life. It surpasses the senses. The aim of iconography is to lead the Christian to the deadening of the external bodily senses, or rather to the transformation of them; to the development of the internal senses and man's deification. Leonid Ouspensky writes: "For the Orthodox Church, the icon is a language that expresses Her dogmas and Her commands so well, just like the word. It is a theology which is expressed in shapes and colors that the eye can see. It is like a mirror that reflects the spiritual life of the Church. In it, someone can understand the dogmatic struggles of every period." The same happens with all the liturgical arts, the music, the architecture, etc. Furthermore, in worship we clearly find the language of symbols - the use of incense, the lighting of the candle, the burning of the oil lamp in front of the icon of the saint, the kissing of the icon, the Cross, etc. - all have something internal and mystical, but also real. For example, with the kissing of the icon we receive the grace of God in accordance with our spiritual condition, and even our eyes are blessed with the view of the depicted saint. We see these and feel them clearly in worship, which we want to "understand" with the translation of it in the contemporary language. The Small Entrance, the Great Entrance, the Cross, the candles in front of the Gospel, the blessing of the priest and the way in which it takes place, etc., all these tell us and give us something different, which goes beyond what our senses feel and what our logic understands. "The first way is that from which we benefit from the same prayers, the psalms and the readings. This is because our prayers lead us towards God and bring about the remission of our sins... The other way in which we are being blessed from these and from everything that takes place in the sacred rite is this, in that we see in them Christ being manifested with His works and Passion for our sake... All the things that take place in the celebration of the Gifts refer to the economy of the Savior, so its vision, being before our eyes, will bless our souls, and in that way, we become worthy to welcome the Holy Gifts. Because, as this economy resurrected the world when it took place, in the same way when it is seen, it makes the soul of those who see it better and holier... This is why vision (theoria) is necessary according to the order of the ritual, to give us these feelings, so that we cannot think only with the mind, but also, in a way to see with our eyes the great poverty of the rich... For this reason this symbolism was invented, so that, on the one hand, it would not declare only with words the events of the economy, but to bring these events in front of our eyes, and also, to be seen in the whole process of the liturgy; thus, with this, to easily influence our souls, and to bring in us not only simple vision, but also passion." 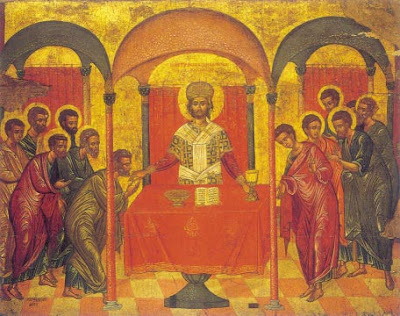 As we can see here, according to Nicholas Cabasilas, man is being blessed in the Divine Liturgy even with the vision of the things that are performed. Moreover, in his Mystagogy, Saint Maximus the Confessor makes an eschatological explanation of the parts of the Divine Liturgy. Here are some examples in which we clearly see that with the things that are performed in the Divine Liturgy we experience the future life. The divine reading of the Holy Gospel "generally implies the coming end of the world". Also, "the procession of the Holy and Venerable Mysteries, is the beginning and the prologue of the new teaching which will take place in heaven, in relation with the economy of God for us, and the revelation of the mystery of our salvation which is hidden in the depths of the divine mystery." "And the spiritual kiss, which is addressed to all of us, is a model and prescription for the peace and like-mindedness among all of us, and the logical identity which will take place at the time of the revelation of the future indescribable goods, which consists of the expectation of faith and love. Because of this revelation, the worthy become familiar with the Logos of God." "Also, the confession of the divine creed of faith, which is done by all of us, denotes the mystical thanksgiving, which we will all do in the other life, for the wonderful words and ways of the omniscient and divine Providence of God for us." "And the triple calling of the 'Holy' on behalf of all the faithful, which is contained in the holy hymnology, shows our union and equality of honor with the bodiless and spiritual powers, which will be manifested in the future." We insisted in this section to see that in divine worship, and especially in the Divine Liturgy, symbolic language mostly prevails. Of course it must be said that the symbolic explanation does not abolish the reality, but it expresses it in the best way. Earlier we emphasized that in the Divine Liturgy we are blessed from the things that take place and from the use of symbols. Let us expand here this issue in order to understand it better. The sign of the Holy Cross does not constitute simply a remembrance of the sacrifice of Christ at Golgotha, but it is an experience of the grace of Christ. Thus, when the priest blesses us with the Cross, or with the sign of the Cross, we receive divine grace. Saint Gregory Palamas teaches on this: "Not only the word and mystery of the Cross, but also the type is divine and venerable, being a divine and revered seal which blesses and completes the generation of people from God, giving them mystical and supernatural goods, which remove curses, destroy death and corruption, giving blessings and eternal life, and is a wood of salvation, a royal scepter, and a divine trophy against visible and invisible enemies. The Cross of the Lord is for everyone, revealing the economy of the incarnation, and in it is the whole mystery." Also, the icon in the Orthodox Church is not a simple remembrance of the saint that is depicted, but it is the expression of the true presence of the saint in the place of worship. As Panagiotis Nellas writes: "The reading of the life of a saint is done to really and truly bring among us the saint with his whole life and his struggles, and on the other hand, this is why the relics of the saint are processed and placed in the church reliquary, or if there are no relics, his icon, and the faithful anoint themselves with the oil lamp of the icon or the relics of the saint." Moreover, even the symbol in the revelation of God to the Prophets, which is different from the previous, "illumines the nature of the one who is symbolized". Saint Gregory Palamas writes: "On the one hand, the natural symbol is always associated with its own nature, for it has a natural being." This is one of the basic points of disagreement between Saint Gregory and Barlaam the Philosopher. By examining things in a rational way, Barlaam underestimated the revelation of God through theoria (divine vision), and he overestimated logic and philosophy (he said theoria is lower than logic); this is why he did not accept the real meaning of the symbol. All this is said to show that the translation of the liturgical texts will never help man to have an essential participation in worship, if he does not previously learn to perceive and to experience the language of symbols. "Today, in order for us to truly participate in the Liturgy, it is not enough to have a Liturgy in our language. Even more, it is not enough to have a translation of the traditional Liturgy in the modern language, because in this case, besides the inadequacy, we will also have the false feeling of fullness." We usually consider the translation of the liturgical texts as the easiest solution. Indeed, it is the easiest solution, in which, because of its easiness, it cannot offer anything to contemporary man, who, as all contemporary art proves, has learned to live and express himself symbolically. When someone reads contemporary texts, he will be able to appreciate this. Contemporary poets and novel writers use simple words, and in this way they "satisfy" logic. But their analysis and their full understanding demands a different knowledge and different approaches. We believe that the Church, with her intensive effort, ought not simply to translate or to interpret literally the texts, but to reveal the symbolic language, which will help contemporary man to really participate in the worship of God.